We like to take trips on short weekends, long weekends, or just any ole weekend that are quick jaunts from the city. We love the North Fork of LI (wine country) and Atlantic City (because the casinos are hurting and need our money). While searching for something different, Nashville came to mind. It’s only about a 2 hour flight, and Southwest Airlines had a direct flight (I also like to play the credit card point game and have earned myself a number of Southwest miles). So off to Music City we went. It's been more than a decade since I was last there and Maribel had never been. Gluttonous gastronomes that we are, one of the things we were most mindful of was where to eat - so we started our research weeks in advance and had a list of places in mind long before we touched down. In fact, shortly after dropping off our luggage, we hit our first stop: Monell's. Monell’s at the Manor honors classic southern food served family style at communal tables. We were seated with two other groups and before long the enormous bowls filled with deliciousness started to arrive: moist, crispy skillet-fried chicken (FANTASTIC for a breakfast), biscuits and gravy, bacon, the fluffiest pancakes we’d ever experienced, country ham, and corn pudding that I still dream about. It was like a southern Thanksgiving with a bunch of strangers! After we came out of our food coma and found the strength to stand, we were invited to go upstairs and check out the gone-with-the-wind-esq decor (which is really probably more of a way for them to drum up wedding business). Monell’s proved to be the first of a number of awesomely delicious meals. 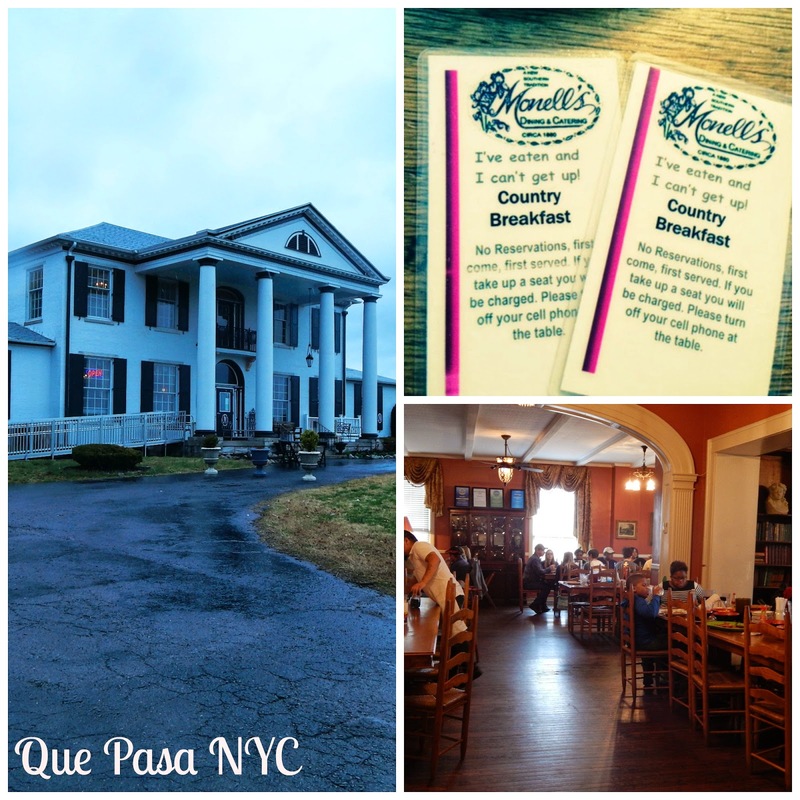 No, eating isn’t the only thing we did in Nashville - lots of great music, lots of history. We visited a plantation, saw the Parthenon of North America, and even checked out the Johnny Cash museum (that guy had quite a remarkable life). Those stops might have to make for another blog post. 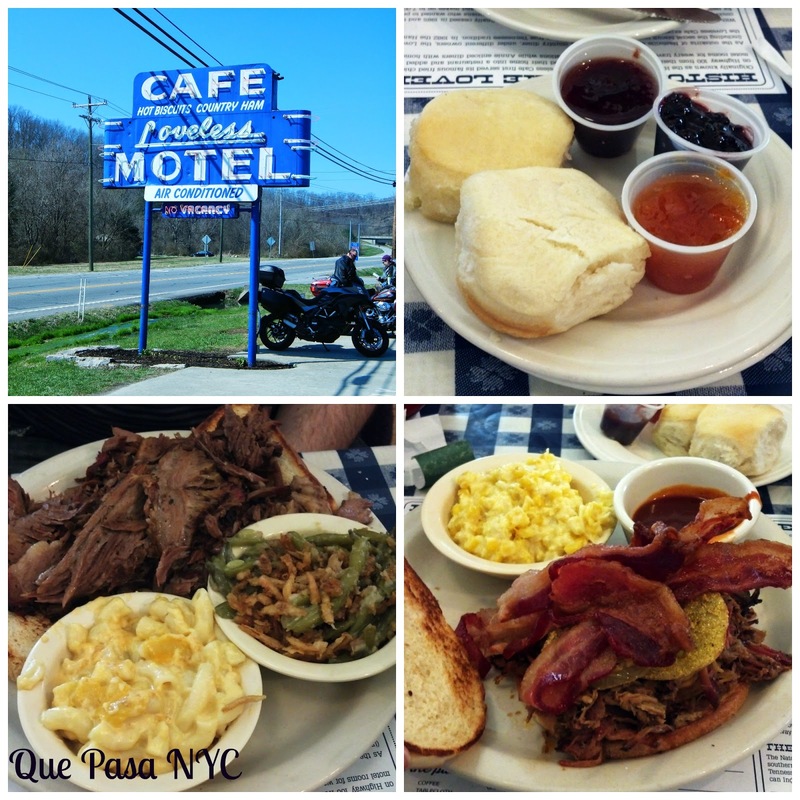 Back to food: one of the places Maribel learned of was the Loveless Café. It was probably a solid half hour drive from downtown Nashville and worth every mile (would've been worth it if we had to walk in 110° heat). The Loveless Café is reputed by many (including the Food Network) to have some of the best biscuits in America –so that pretty much means they are the best on the planet, since I don’t know how many other biscuit eating countries there are. Waits can get lengthy - we arrived at the compound around 10 AM and waiting about 90 minutes. And yes I did say compound. Brilliantly, they've devised ways to get money from you while you're just waiting to spend more money –the former motel rooms are now shops where you can buy everything from their biscuit mix to art. The highlight of the meal was the biscuits - they were nothing short of amazing. They came with great, homemade preserves (bourbon-blackberry, strawberry, and peach) but really, just slap some butter on those bad boys and you're in biscuit freaking heaven. While we could've (possibly should’ve) stopped at the biscuits, of course we didn’t. We also ordered brisket, which had just enough fat melting in your mouth, and a rocking pulled pork sandwich with perfectly sweet yet spicy sauce. In short, the food made us wish we had 4 stomachs. In part deux I'll share a couple of other gems that help make Nashville worthy of a spot on your short-list of places to visit. One Responses to "Nashville Noshing pt 1: Monell's and Loveless Cafe"
I didn't realize Nashville was that close of a flight, nice! And yummy food mmmmmm! Just what I needed to see when I'm on a train and haven't had breakfast. lol BISCUITS and BACON, good Lawd.